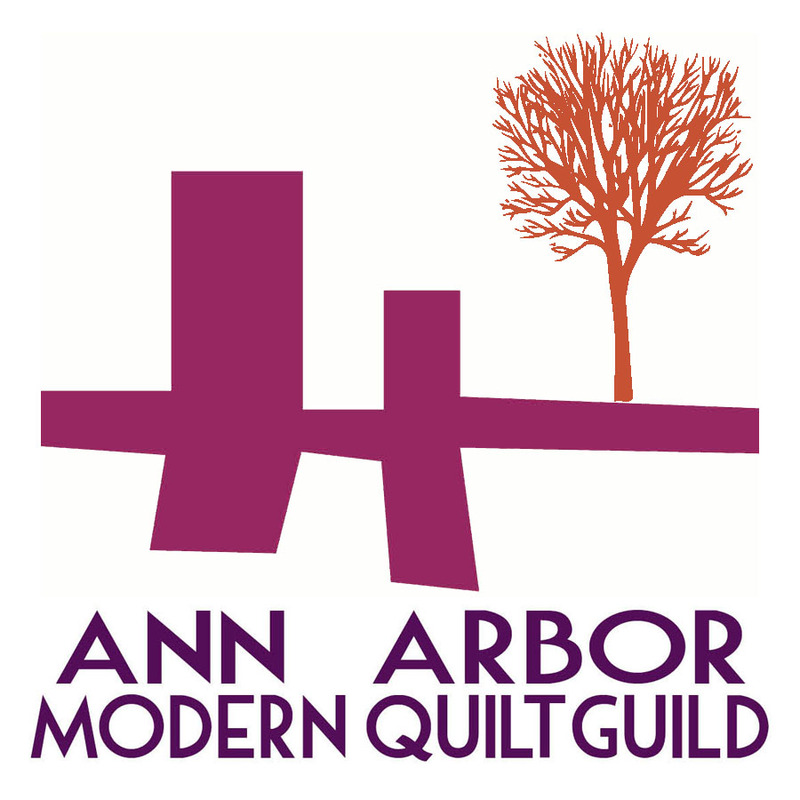 The Ann Arbor Modern Quilt Guild has a Pie Making Day challenge at the end of this month and this is my entry. The fabric was designed by my friend Brenda, and is available for purchase at Pink Castle Fabrics, and I really love the yellows and greens in this line best, and then I didn't use them, because, art is all about leaving things out, isn't it? (Is it? I really don't know...) Actually, this was a four color design, and I wanted to use a different green, and then the yellow didn't work. For quilting, I made each area different. The orange parts are quilted with orange thread with sort of a flower (not pictured). The green is contrast quilted with a ring. It's based on this Leah Day design, the Daisy Echo, but without the daisies so that it would be suggestive of rings, because rings... Anyway, when you can't think of how to quilt something, just browse Leah Day's amazing Free Motion Quilting Project) and be completely inspired. 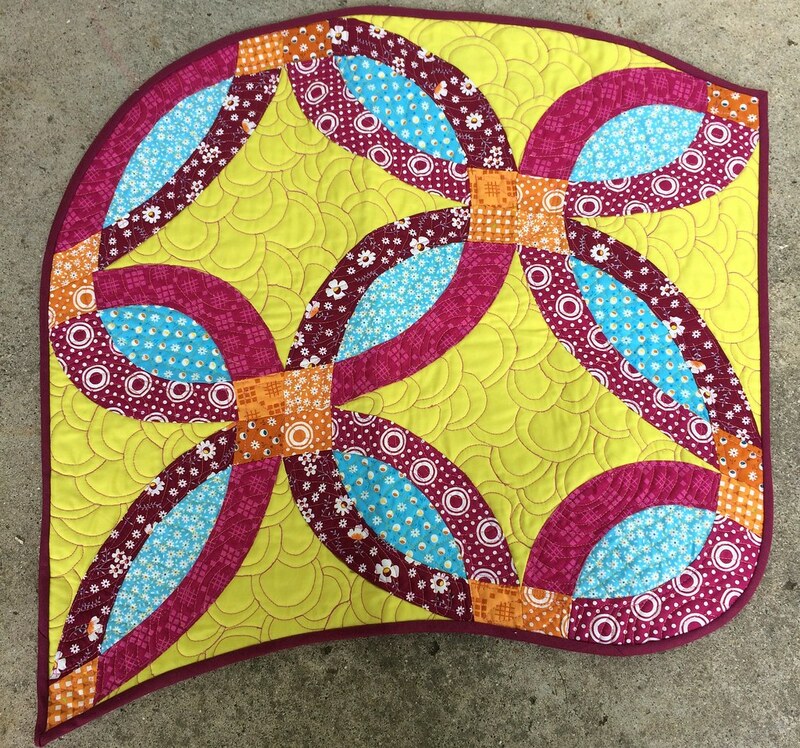 The red violet pieces are quilted in semicircles, with orange thread. 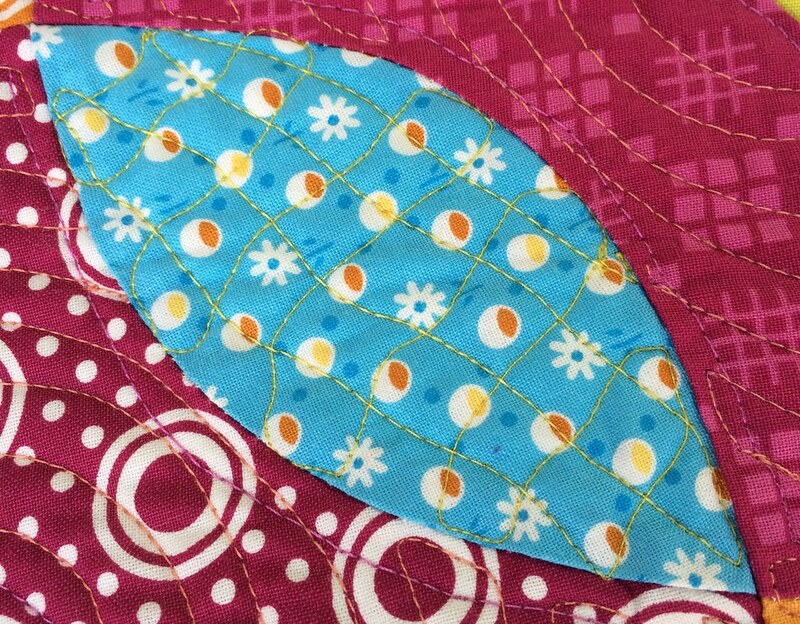 The blue petals are my favorite, quilted with another of Leah Day's designs, Matrix, in green thread. I love this one so much! It's super easy and looks awesome, and I want to use it on everything. I tried to just outline the red violet bits in red violet thread, but I need to cram my free motion quilting in, or else it looks not done to me, so, I went back and added.